You've had a past life as a PhD Microbiologist, which shouldn't come as a surprise. How did you go from microscopes and petri dishes to teaching the world about macro photography? This was a coincidence of events with the first affordable DSLRs coming onto the market, and me having plenty of time as I had already managed to take early retirement. These combined with an interest in gardening and my background in microbiology naturally seem to lead to me trying macro photography. Where do you find your subjects? 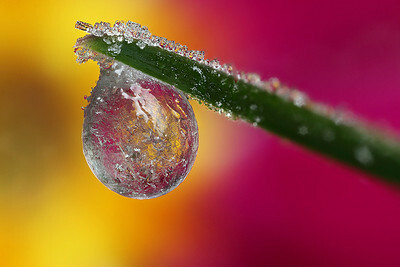 What are your favorite macro subjects and why? I take nearly all my shots in my own garden. Because I have koi pond, I have not used insecticides in the garden for many years and it turned out to be a small haven for insects. Although they do not have universal appeal, I enjoy taking photographs of insects the most – I think because it requires hunting skills as well as photographic skills to pull it off. 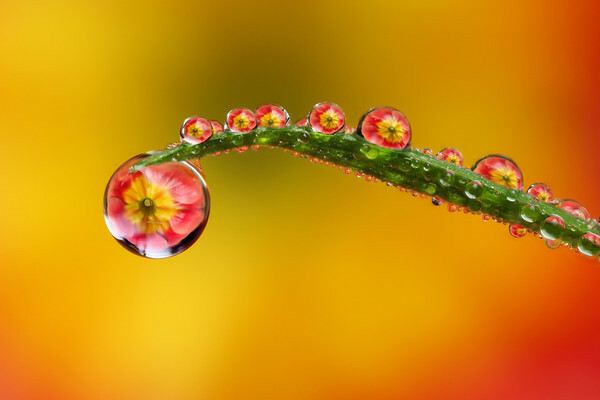 How long have you been honing your macro skills? Do you do other types of photography? Have you developed any new techniques recently? 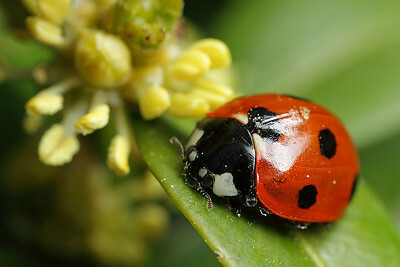 I started macrophotography in 2005 with a Canon 300D DSLR and a Sigma 105mm macro lens. I still do the normal "family" type photography, but not with any skill. I don't think I can claim to have developed any techniques, but rather may have simply found how to apply various techniques to macro photography. So I think I have helped popularise the use of focus stacking to increase the depth of field in macro photographs. 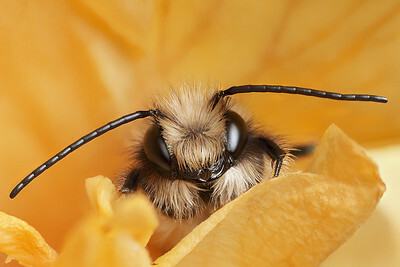 Macro photography opens you up to a whole new world of interesting behaviours and the diversity of species. What is the most unexpected behaviour or detail that you have found through your photography? I think the oddest thing was finding mummified aphids with a circular porthole cut into them. I was able to find out and photograph them being parasitised by very small wasps. What challenges would you say are particular to macro photography? Which macro lenses do you use and recommend? The best all-round lens for macro is a prime lens around 100mm focal length. I have yet to come across a bad macro lens made by a major manufacturer so Canon 100mm, Tamron 90mm, Sigma 105mm, Canon 60mm EF-S (to name a few) are all optically excellent. Longer focal length macro lenses not only cost a lot, they are harder to handle hand held, more difficult to get higher magnifications with and are in general slightly less sharp than their smaller cousins. I'd only recommend getting one if you will be shooting very nervous or dangerous subjects, or if you really do want the lovely background bokeh they can give. With a 1:1 macro lens of 150mm focal length or less you can get to 2:1 magnification or higher using a full set of extension tubes (68mm). The ultimate high magnification lens is the canon MPE-65 which goes from 1:1 to 5:1 magnification without additions. Is there a “starter” set up that someone might use to test the macro waters? One alternative is to start off with a set of extension tubes (e.g. Kenko) and use them with a prime lens you already own, around the 40mm to 85mm range. The only major disadvantage is the loss of infinity focus. An even cheaper alternative is to use lens reversing techniques: You can reverse either a kit lens, or say a 50mm lens, directly onto the body using a reverse body coupler. This can give suprisingly good results but suffers from the problem of losing aperture control. You need to preset the aperture of an autofocus lens whilst the lens is mounted normally, set the aperture in Av mode, press the DOF preview button and remove the lens whilst keeping the DOF preview button depressed. This leaves the aperture set on the lens until the next time it is mounted normally but does result in a dimmer viewfinder. If you try this, you can get around this problem by using an older, manual lens which has an aperture control ring. Lighting is very important for this type of photography. Are there any special considerations the blooming macro shooter should know? Natural light is fine for macro shooting up to 1:1 magnification but past this, keeping your subject lit becomes increasingly difficult. I tend to use natural light where I can for flowers and often larger bugs such as butterflies and dragonflies. I prefer shooting natural light on slightly cloudy days as this avoids the high contrast and ugly specular highlights you can get with full bright sun. I normally dial in some negative Exposure compensation (around -.3 or -.6) to avoid blown highlights but this does vary with camera body. Obviously, if you have a static subject and some form of stabilisation (e.g. tripod or bean bag) you can drop the shutter speed. Flash has a number of advantages for macro work: you can always get enough light with small aperture values that are often used to get reasonable DOF, and it helps provide very high, effective shutter speeds (the flash duration) which helps stop motion blur (on either you or the subject). It becomes a necessity for most shooting above 1:1 magnification, simply because there is not normally enough light. I use standard flashguns (430Ex) mounted on a bracket with a diffuser. You can obviously use macro flashes but I would avoid single flash tube ones and ones where you cannot move the flash heads, which only really leaves the rather expensive MT-24Ex. Single tube macro flashes tend to give very flat-looking shots and dual tube macro flashes are rather hard to diffuse adequately. Above 1:1 you may need to start opening up the aperture more if you want to avoid diffraction softening. I tend end up around F5.6 at 5:1. Put the flash in ETTL mode, but remember that the FEC (Flash Exposure Compensation) will need to be adjusted depending on the shot brightness. I have to adjust mine down to -.66 for dark backgrounds or no close background and up to +1.66 for a white background from a normal setting of 0 FEC (note the normal setting for good exposure of a grey card may not be 0 FEC on some setups). There are some situations where you may want to shoot mainly natural light but add some flash to light the subject a bit more – this often occurs if the subject is significantly backlit. Typical camera settings as for natural light shooting but with EC probably at -.66 and FEC set on the flash around -.66 to -1. What tips can you give us for successfully focusing on such tiny subjects? I tend to use the same focus method no matter what I'm shooting. I set the magnification I want with the focus ring with the lens set to MF and then focus on the subject by moving the camera towards the subject. If I'm hand holding or using a pole then once I'm near focus I gently move the camera back and forth by swaying slightly and take the shot as I pass through the focus point I want. If I'm resting the camera lens on something then I gently move it forward until I get the focus point I want. It does take a bit of practice doing this but you will get more keepers this way once you have mastered it. With most bug shots they work better if the eyes are in good focus unless you are specifically trying to focus on some other detail. Can you tell us more about Focus Stacking? What it is, how and why do you do it? Focus stacking is not a necessity for macrophotography but it suits my preferred style of trying to capture sharp detail in shots. I use fairly open apertures to avoid diffraction softening of the image and focus stacking allows me to get the DOF I'm losing. Here's a step-by-step tutorial on focus stacking using one of the freeware software stacker programs. I do however now use the commercial programme Zerene Stacker as it has many advantages over the combine series. It keeps low contrast detail, is better at reducing haloing and also better at aligning as it does do rotational correction as well. 1. You need to be pretty good at focusing to get the overlapping DOF slices needed for a good stack. It does, however, sharpen up your focusing and can be good practice for focus bracketing a shot. 2. Some focus stacks can look very unnatural due to the abnormal DOF which can flatten the image and also give rather odd DOF boundaries on the background. This is largely a matter of personal interpretation of a 2-D picture and what we normally use for depth cues. Problems like this can often be avoided by using incomplete stacks and careful choice of shooting angles to avoid sharp DOF boundaries. I often also cheat by doing what I call differential focus stacking by hand where I only focus stack the parts of the image I want more DOF in, often not stacking the background. 3. Some subjects are almost impossible to focus stack if they are moving, although you might be suprised what you can stack if you get used to shooting quickly. We hope that everyone reading this is a little inspired to go outside and see the world with new eyes. 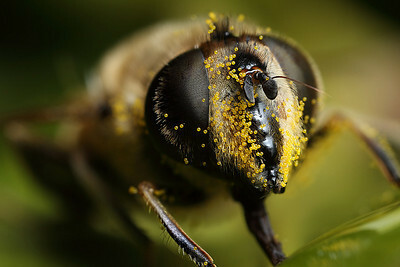 Whether you rent a new lens and try focus stacking on your own, or just cut a little more distance around your local honeybees, we hope that you all appreciate the big, big world around us... camera or not.